Enter a wonderful middle-eastern world filled with ornate and elaborate architecture, hanging flowers, rich foods and a palace filled with blossoming culture. 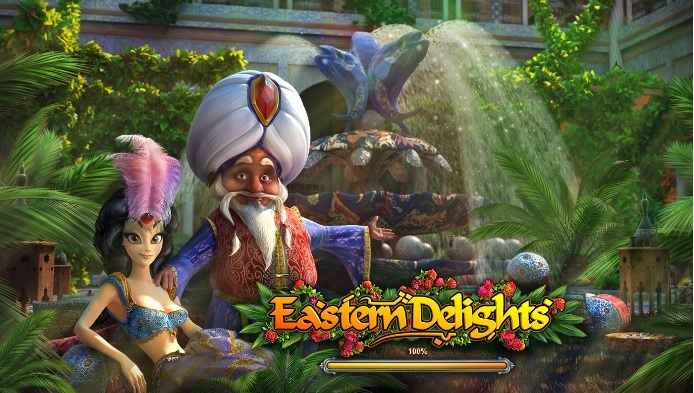 Eastern Delight is a wonderful, little online video slot that allows you to enter the Sultan’s palace, along with his beautiful Princess daughter and spin through 5 reels of detailed slots with Indian lettering. This is an exceptional game for the gamer looking for a slice of some cultural pie. Play slots today! The skills and creativity of the developers at Playson have been impressing players in every slot experience they choose to explore. Fun, complex themes and plenty of features to keep things interesting are at the core of every slot game in their portfolio, to which players are constantly attracted. Eastern delights was created to present to you the pleasure and wonders of the Middle East, showering you in lushness and tempting you with big prizes. You can learn more about Playson's other games here at https://www.easyslots.com. The Middle East might seem like a very far place, but thanks to Eastern Delights, you can experience it at its best, having a taste of what it’s like to be a Sheik, living in luxury, comfort and happiness. The tasty food, huge and complex palaces, elegant sand dunes and colourful, high-quality clothes, all paint the picture of a lavish lifestyle, where nothing is missing. 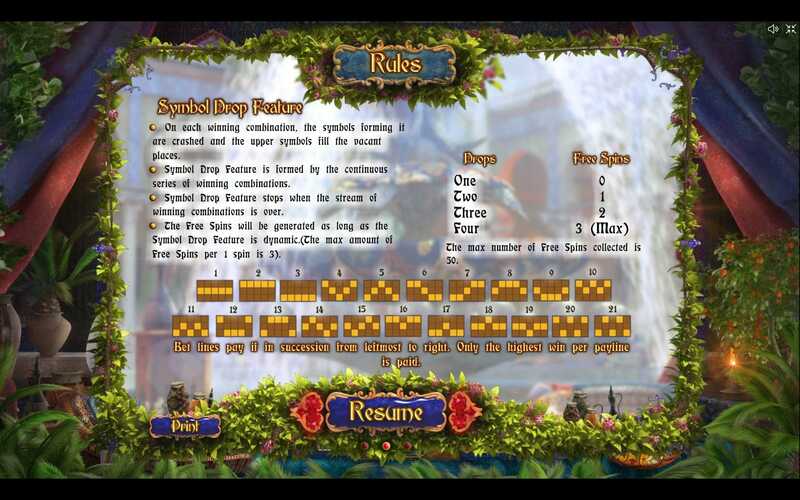 Attention to detail is crucial in the design of this slot game, so as to properly convey the Middle East style. A friendly old Sheik is waiting to welcome you into his world of abundance and no worries. He’ll even share some of it with you, so don’t miss out on the opportunity! Eastern Delights has 5 reels and 21 paylines meticulously developed. The graphics convey opulence through the expensive fabrics and lush greenery around the reels, as well as the vibrant colours used. The burning flames, along with the slow breath of the Sheik as he sleeps and eats fruit only add substance to the experience, along with the traditional Eastern music. The old man wakes up once you start spinning, and claps at every winning. Chances are, you’ll grow quite fond of him. You can bet between 0.01 and 3.00 credits. (Read more about Easy Slots promotions). The symbols are a delight to look at, because of all their intricate detailing. They include exotic fruit, enticing food, a peacock and a beautiful princess. Whenever a winning combination is made, those symbols are crushed and new ones fall on top, making way for multiple wins during only one spin. The Wild Card is the golden framed question mark symbol, which substitutes any other symbol beside the Scatter and the Crash, in order to form more winning lines. The Arabian Princess symbol is the Scatter, and by spinning 3 or more of them, you activate the Free Spins Mode, starting with 4 Free Spins. However, up to 50 of them can be collected, through the Symbol Drop Feature. The Lamp symbol represents the Crash in Eastern Delight, meaning that it destroys all the horizontal lines on which it appears, that way continuing the Symbol Drop Feature and making way for more winning combinations. Then, a Total Bet is given at the end. 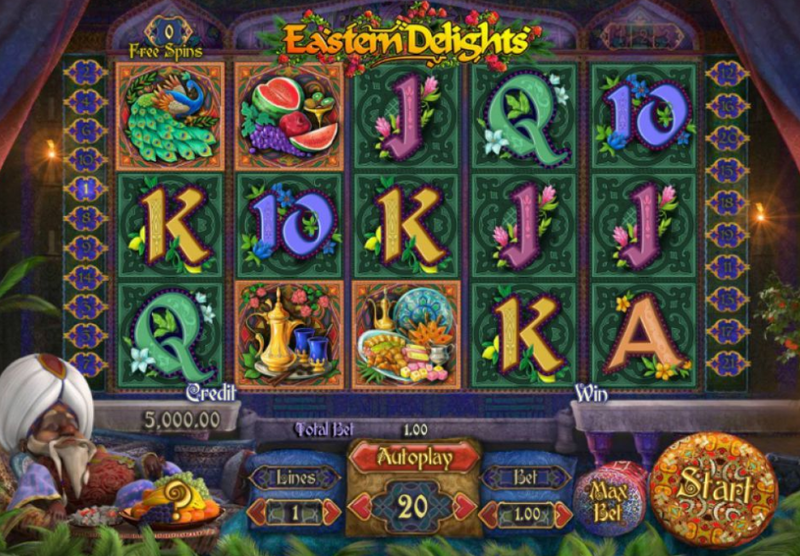 Easter Delights has a unique theme that is very well executed in this slot game, thanks to the carefully designed graphics, which can’t disappoint even the pickiest player. It is a delight only to look at it, and when you start playing, you might just discover this is one of your favourite slot experiences. More popular online slot games, visit here! Join and spin the wheel today at https://www.easyslots.com for a chance to get a free spin!